In 2011, Ethiopia, Somalia, Djibouti and Kenya faced the worst drought in 60 years. In Ethiopia, failure of successive rainy seasons brought about massive crop failure, the death of livestock and critical food and water shortages affecting 4.5 million people in eastern, southern and northern parts of the country. Caritas launched an appeal for €1.4 million to help some 65,000 people with food, water and the recovery of livelihoods. Ethiopia’s rain-fed agriculture is acutely vulnerable to small variations in the patterns of rainfall. Caritas has learned that communities must be given the means to become more resistant to drought. Caritas launched a further appeal for €2.5 million in 2012, helping 60,000 farming and herding families to improve their chances of riding out a drought. Caritas Internationalis works in Ethiopia through its national member, the Ethiopian Catholic Secretariat. Read how the work of Caritas has changed the lives of three families in Ethiopia. Hanna Loha is a 23 year old woman who lives in Ansomegambela village in the southern Ethiopian district of Wolaita with her husband, their three children and their cow. Even though she owns a small plot of land, she neither can afford to buy seeds and fertilizers nor has the technical skills to make use of it. Her cow is currently the only means of income for the family. Whatever little money the family earns, they use up on their daily living expenses. Having enough money to spend developing their land is unimaginable. A local committee identified Hanna as one of the poorest in the area and selected her to benefit from the support of Caritas. The Drought Recovery and Rehabilitation project (DRR) run by the Ethiopian Catholic Secretariat works with those who own land but haven’t the technical or financial means to utilise it. Caritas supplies improved seeds for cash crops and vegetables as well as technical support. Ethiopian Catholic Secretariat’s office in the regional capital Soddo says that Hanna and others who have benefited from the scheme will receive a quarter of a quintal (25 kilos) of seeds each and they will produce more than 10 quintals of maize from every quarter of quintal of seed. 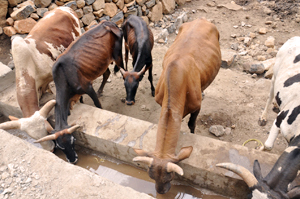 Livestock using the newly constructed cattle trough by Caritas. Leteberhan Zenebe says that safe drinking water is a priority for the small village of Mahbere Selassie in Tigray, a northern region of Ethiopia. Villagers use a nearby spring for themselves and their livestock, but the spring isn’t well kept. Waterborne diseases are common, especially among children. Ethiopian Catholic Secretariat identified the village of 380 families as in need and used the funds raised through the international appeal to start building a water point. Villagers helped via a cash for work programme, including developing spring capping, collection chambers and cattle troughs. Leteberhan says already they are benefiting from the spring development as some part of it is completed. They can access clean drinking water from the water point and the cattle trough for their animals. “If you compare the water we were drinking before and what we have now, the difference is obvious,” she said. “We have our own spot to get the water and our livestock have a separate spot”. According to Leteberhan said the people of Mahbere Selassie are very happy as they are also earning daily wages for participating in the construction of the water point. “Especially for us women it was very difficult to go to town in search of work and make some money as life here in our small village is very hard,” she said. The community members have already established a water committee to actively monitor the fair use of the water point and ensure its sustainability. Out of the 380 households 69 of them are headed by women. “This is a life changing project for us, we have managed to earn money for our expenses and at the same time built ourselves a longstanding water point, we are very grateful to the Catholic Church,” she said. The Datecha family lives in Kadida Gamella District in the Southern Nations, Nationalities and Peoples’ Regional State, which was one of the targeted areas for Caritas during the initial drought. Yohannes Datecha in his backyard taking care of his cow. A year and a half ago, Yohannes was farming traditionally. He never produced enough for market, only enough for his family to eat. Things got worse when he lost his two cows due in the 2011 drought. The burden on him and his wife and even his small children to earn some money for their daily consumption was too much. 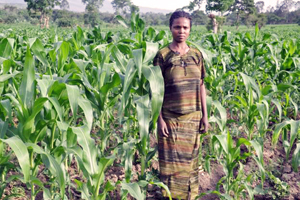 After being identified as a beneficiary by Caritas, Yohannes received better seeds for wheat and technical support. He was able to sell the wheat he produced and then bought a cow with the profit he made. Since then he says he has been able to provide milk for his children and sell the rest of the milk to earn extra income. He has saved any extra income in a credit and savings association set up by Caritas. His children can go to school without the burden of having to contribute to the family’s daily costs.